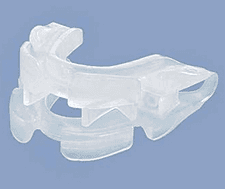 Snore Eliminator is classified as a mandibular advancement device. 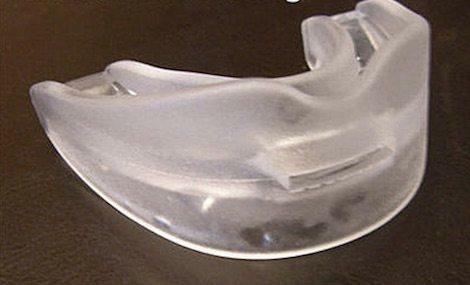 It is designed to hold your lower jaw forward to keep your airway clear of obstruction while you sleep. It is marketed as being the industry’s most effective snoring solution. I disagree, and so does my wife. We both put Snore Eliminator to the test and we had a very long week. 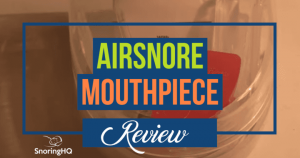 Snore Eliminator ranks very high on my list of most disliked mouthpieces. There are so many other good anti snoring devices to choose from. I am sure it works for some people, even though I can’t imagine how. If this MAD is one you are considering it is really important that you become familiar with all the pros and cons before making your purchasing decision. Device can be custom fitted at home using a boil-and-bite method. Very inexpensive price and free shipping is available. Airflow hole makes it suitable for anyone who breathes through their mouth. Mouthpiece was designed by an experienced dentist. Easy-to-clean using toothpaste, mouthwash, or denture cleaner. 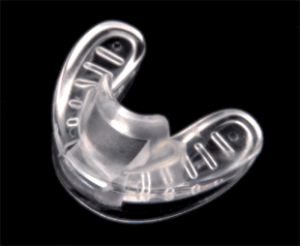 There is no mention of the snoring mouthpiece being free of BPA or latex. Snore Eliminator is not cleared by the United States Food and Drug Administration. Original model does not permit you to make adjustments to lower jaw placement. Bulky design is very uncomfortable, and practically impossible to wear. There is no mention of the device’s lifespan. Website does not offer a phone number, address or email. The only want to be contacted through an inquiry form on the website. I really did not like Snore Eliminator. I found it uncomfortable, ineffective, and having few redeeming qualities. I strongly suggest looking at other snoring mouthpieces and trying those as an alternative to Snore Eliminator. This review is for the original Snore Eliminator. There is now another version called Snore Eliminator Pro that allows you to make adjustments to it. The original one does not permit adjustments to be made. It can be fitted using the boil-and-bite process, which is quite simple to do. Snore Eliminator does have an airflow hole, so you can breathe freely through your mouth all night. This is an important feature to look for, if you have sinus issues or a deviated septum, or if you simply have bad allergies like me. So, it does have once good quality. The device is made of a hypoallergenic and sterile material. This does not tell you much though, does it? There is no mention of it being BPA-free, and as you probably know, BPA is not something you want in your mouth several hours every night long-term. There is also no mention of it being free of latex, so unless you are 100 percent certain you don’t have a latex allergy, I would be very cautious about using this product. Most people don’t know they have an allergy until they actually have a reaction. Snore Eliminator has not been cleared by the United States Food and Drug Administration. Also, this device is listed as being an effective alternative to expensive CPAP machines. It is very concerning that a manufacturer would be so irresponsible to recommend using this mouthpiece instead of a CPAP machine without instructing to speak to a sleep specialist or dentist first. If you have been diagnosed with sleep apnea always talk to your medical care provider before using any mouthpiece or discontinuing use of your CPAP machine. At $19.99, Snore Eliminator is definitely one of the cheapest MADs on the market. The Pro version is $20 more, in case you are wondering. Shipping is free to 48 of the states. This mouthpiece does have a 30-day money back guarantee and all orders are shipped USPS. When the devices arrived, I cleaned them with a denture cleaner, and then we did the boil-and-bite process to get a custom fit. I already knew we were going to have issues with these mouthpieces, and by “we,” I mean “my wife.” These things are bulky and uncomfortable. From the second I put it in my mouth it felt all wrong. It reminded me of old mouth guards I wore back in my hockey days as a teenager. If I immediately didn’t care for it, I knew my wife was going to absolutely hate it. Guess what? She tossed her mouthpiece on the nightstand within 15 minutes. In the morning, I was surprised that my Snore Eliminator was still in my mouth. I thought for sure I would have “spit” it out in my sleep of course, when I removed it from my mouth, I really wished I had lost it at some point. My jaw ached, and considering I was dragging to get out of bed, I assumed I hadn’t slept very well. When I saw the look on my wife’s face when I joined her in the kitchen, my assumptions were confirmed. She said I snored all night, even wearing the device. Since it clearly had not worked at all and it was terribly uncomfortable, I decided to try the fitting process again. I thought maybe I needed to try extending my lower jaw more before biting down. Well, I woke up in the middle of the night, my mouth hurt so badly I could barely close it. Clearly, extending my lower jaw was not the solution. I left it out for the rest of the night and decided to try fitting it one last time the next day. So, by the third night I felt like Goldilocks, hoping when I fit it again it would be just right. Sadly, the next morning my wife told me to retire this one because she didn’t want to listen to me snoring anymore. I didn’t argue. Is Snore Eliminator a Good Option for You? You may be tempted to order Snore Eliminator because of the low price but why compromise your sleep and health even one more night? Maybe it’s worth a one night test, but I think there are plenty of other mouthpieces that are affordable, comfortable, and effective (I’d take a hard look at Zyppah or even the VitalSleep device). Look at my best anti-snoring devices for recommendations. How can they sell an anti snoring device without FDA approval. I’m pretty sure that it needs to be cleared in order to sell in America. I don’t understand. Make sure to purchase from a reputable company that has FDA approval. Some companies have devices approved for sale over the counter now and are available at CVS and Walgreens.